Reed Farrel Coleman's latest Moe Prager crime novel, Innocent Monster, is due out next week. It's the perfect time to have him write a guest blog. According to his website, Coleman "Has published twelve novels—two under his pen name Tony Spinosa—in three series, and one stand-alone with award-winning Irish author Ken Bruen. His books have been translated into seven languages." "Reed is a three-time winner of the Shamus Award for Best Detective Novel of the Year. He has also received the Barry and Anthony Awards, and has been twice nominated for the Edgar® Award. He was the editor of the anthology Hard Boiled Brooklyn, and his short fiction and essays have appeared in Wall Street Noir, The Darker Mask, These Guns For Hire, Brooklyn Noir 3, Damn Near Dead, and other publications." It's my pleasure to welcome Reed Farrel Coleman. In the first book in the Moe Prager series, Walking the Perfect Square, Moe describes himself as nobody’s hero. Of course, that’s not quite true, but it is very revealing about Moe’s character. It is, in fact, the echo and sway between how Moe sees himself and how other characters perceive him that gives the series some of its subtle, underlying tension. There is no drama without tension and to keep a series engaging, you must keep threads of tension running through the books. There’s obvious tension in mystery/PI novels that revolves around the central crime or crimes: Who was murdered or kidnapped or blackmailed? Who is the victim? Why was it done? What obstacles stand in the way of the PI, the cops, or the amateur sleuth? But it is the tension that exists between regular characters in a series that gives a series continuity. Another thread that runs through the series is the tension between Moe’s belief that he is an open, forthright kind of guy and his being forced to keep terrible secrets. As Moe might say, you build walls around secrets to protect them and eventually all you become are the walls. But in the fifth Moe book, Empty Ever After, Moe vows to give up secrets because, as he sees it, those secrets have destroyed the people closest to him. It doesn’t last. It can’t. In the new Moe book, Innocent Monster, he’s back to his old tricks. But he’s less angst-ridden about it because he’s older now and has come to accept himself for who and what he is. One of the really important threads of tension that runs through the books is the conflict between Moe’s day job—he and his brother Aaron own a chain of high-end wine stores—and his love of working cases. This thread is so important because it is something every reader can relate to, the tension between what we wanted to be and what we are. So the next time you pick up a book in your favorite series, think about how the author has sewn the threads of underlying tension. 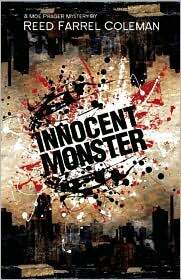 Innocent Monster (Tyrus Books, Oct. 5, 2010) is the sixth Moe Prager novel. Reed Farrel Coleman has been called a hard-boiled poet by NPR’s Maureen Corrigan and the noir poet laureate in the Huffington Press. He’s published eleven novels—two under his pen name Tony Spinosa—in three series, and the stand-alone Tower co-written with award-winning Irish author Ken Bruen. Reed has won the Shamus Award for Best Novel of the Year three times, won the Barry and Anthony, and twice been nominated for the Edgar. He is a co-editor of The Lineup and was the editor of the anthology Hard Boiled Brooklyn. The former executive VP of Mystery Writers of America, Reed is an adjunct professor at Hofstra University. You can reach Reed on his website, http://www.reedcoleman.com/, Facebook, or Twitter. Good post. Stumblers are very attractive aren't they? Maybe because most of us arestumbling day by day! You're so right, Paul. Most of us are stumbling through our days, and our lives. I'm glad Reed was able to define that. Oh, Jen, I think you underestimate yourself. All we can do is hope to do good as we stumble through life. Yeah, I wanted to be a doctor, up until junior high school and I discovered just how badly I sucked at anything having to do with science. So...I can relate that thread Reed. Well, that's a good example, Ricky. Very good example. One of my favorite writers and one of my favorite series. Moe Prager is one of my heroes, and Reed Farrel Coleman is too. I can hardly wait for this one! Thanks, Lesa!! You're welcome, Kaye. See, he is someone's hero! This series and this author is totally new to me--another from-Lesa find, thank you! Oh, I like that, Jenny. "Lesa find." You're welcome! And, tomorrow I'll let a debut author introduce herself. I'm liking her book. I've wondered about this series. Glad to see a blog post about it and comments. Have you read these books, Lesa? I always worry about "hard-boiled" mysteries, if there's too much violence and gore. Or, if there's sexism, if the women characters are either minor or not well portrayed. I haven't read them yet, kathy. I can tell you that one of my favorite bloggers, and a friend, Jen Forbus, reads and loves them. Jen's favorite authors are Craig Johnson, Louise Penny, and Chris Grabenstein, if that's any help.